I already wrote about This American Life Live. I need to download this weekend's radio show, which will include bits of the entire six-city tour. Listen if you get a chance. There was a new member at my book club meeting and I don't think he got the idea that most of us just hadn't finished (or even read, in my case) the book we were supposed to be discussing. He kept wanting to steer the conversation back to the book, which made some of us giggle. We aren't always so lazy, I swear, but it has been known to happen. We attended the last night of the 2007 William S. Paley TV Fest, which was a panel on The Simpsons. I usually attend several of the events, but only went to three this year, which I suppose I was lucky to do. There were major ticketing issues this year and many of us loyal members got royally screwed. The MT&R did what they could to make it up to some folks, but not others. We did get comped in to The Office panel, which was lots of fun. Click here for a review of that night. We barely got into Heroes. I'm pretty sure a friend of mine didn't and ended up leaving. I haven't told her yet that there were four empty seats in my row, right in the center for entire night. Yet, E and I couldn't even sit together. Hmm. Hopefully, they will get their act together for 2008. I was pleasantly surprised to actually have a nice meal of corned beef, cabbage, and potatoes on St. Patrick's Day. I found out with a bit of short notice that we'd been invited to a birthday party that afternoon. I was under the impression it was a barbecue and was fantasizing about having a grilled hot dog or burger. So, it was a nice treat to have the other, which was delicious. We followed up the afternoon birthday party with a bowling birthday party, which turned out to be much more fun than I had anticipated. (You should have come, Ren!) It also made me realize how much I miss one of my friends who I rarely see anymore. There has also been a lot of time spent parked in front of the tv to catch up on The Office. We completed the Season 1 and 2 DVDs, including most of the special features (we skipped a few commentary tracks). We've watched the first four or five shows of the current season (gotta love the internets) and if all goes as planned, I'll be completely caught up by Tuesday April 5th. E and I are both obsessed! E and I ventured out with Rusty The Dog today. First, we went to the Best Friends Pet Adoption in Burbank. No, we aren't getting another pet, anytime soon, but it's fun to check out the animals and some of the vendors. The rabbits were really adorable. I swear, if I didn't have to work full time, I would have a menagerie. After the pet fair, we thought it'd be nice to go for a drive and take Rusty to the Hydrant Cafe, which we'd been to before in Venice. Well, apparently it has been a long time since we went because it turns out that it is gone. Bummer, but we decided to walk along the Venice Beach Boardwalk instead, which is always entertaining. Rusty certainly had a great day and is snoring now. 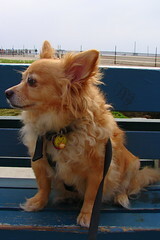 Rusty hanging out at Venice Beach. looks like rusty had a great time! it would have been nice to see people but why bowling? why do people think bowling is fun? >ac: He did. He is so sociable and saw so many dogs and people yesterday. He curled up on my lap last night and just purred. I'm buttering him up for an upcoming (minor) surgical procedure. >Ren: Because it's fun. Duh! >S.J. : It figures that we are so dumb here in America that we don't even eat the right thing! Geez! Rusty's cute - is he new to you? Kevin wants to steal Rusty. I want to steal one of Jenn's cute little children. Maybe we should get some goldfish or something. Is There A Tooth Fairy For Dogs? "Dunder Mifflin, this is Jodi..."
Will It Be A Three-peat?